This is a classic Tupperware item that most people probably remember from their grandmother’s cupboards – the Jel-Ring Mold. This is definitely one of my favourite. You can make a variety of super delicious concoctions with this kitchen gadget. It is actually a 3 piece unit that comes apart for easy unmolding. You can mold anything such as meats, salads, fruits and of course Jello! There must be hundreds of recipes available from Tupperware and other women who have discovered many uses of this one kitchen tool. It makes for an excellent food party certerpiece as well. Jello is not just an adult favorite, kids love it – perfect addition to foods for kids party. Fill it up with water and use the ice to lay your cooked shrimps and add a dip in the middle. Ask your Tupperware consultant for the recipes! Love this post? Signup for updates… it’s FREE! 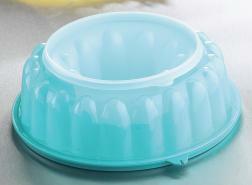 I am sure the person you bought the #tupperwarejelringmold will be more than happy to provide you the recipe. Let me know.